How could a contemporary archive in an art institution be organized, what can or should its parameters be? The Fundació Antoni Tàpies in Barcelona shows how an interactive archive of visual and performance art can play a dual role; the archive both renders the institution’s past more accessible to visitor groups, and, while doing so, also raises the question of exhibiting archives in the museum space. During a short research stay in Barcelona in May 2014, I was introduced to the specifics of this programme to organize the museum’s archive material, which I will examine in this text. The Fundació Antoni Tàpies, founded in 1984 by Antoni Tàpies and opened in 1990, is a museum for contemporary art that combines the heritage of Tàpies with varying exhibitions. Considering itself as “a research centre across disciplines” the Fundació claims to “set up cooperative ventures with experts in different fields of learning“ and to accompany exhibitions with symposia, lecturers and publications. Especially under Laurence Rassel, director since 2008, the Fundació Tàpies has put the emphasis on widening traditional exhibition formats and looking for new ways of interacting with the public. The website is still not completely developed but allows registered visitors to interact by tagging photographs or posting comments. The physical workspace in the museum, however, is already completed. There, visitors can consult the full contents of each dossier, including items not yet online. The Fundació Tàpies follows a precise scheme for archiving each exhibition, one which was designed by a company commissioned in 2007. The firm took the museum’s existing work flows as a starting point and set up a scheme with several categories for each registered exhibition, including provenance, date of registration and a short description of each record. When I consulted photographs and press releases for a number of past exhibitions during my stay in Barcelona, Núria Solé Bardalet, archivist in the Fundació, explained that the database is organised by exhibitions, while the storage of the material, on the other hand, is by document types, with separate locations for papers, print photos and digital ones. Each catalogued exhibition dossier indicates where the material is located: “We developed a typology of documentation”, Solé Bardalet underlined in a short interview. She further outlined the educational programme Open Source Prototypes, related to Combined Arts. In the frame of this programme the Fundació Antoni Tàpies invites groups of visitors to work with the archive and create interventions in or outside the museum space. “Open Source Prototypes” intends to make different groups of people familiar with the archive. Therefore it not only actively invites scholars but also groups such as an amateur drawing association, or technicians employed in Barcelona’s city hall. I want to refer to two examples from Open Source Prototypes that show how different groups worked on archive material. The Fundació offers a systematic framework for using “old” documents to create “new” outcomes. In this way, the educational programme also enlarges the archive by including new creations as they are made. Open Space Prototypes also provides a space for the newly established interventions in the form of exhibitions or performances based on the work in and around the archive. The two exhibition examples I chose show how the institution engages in setting up exhibitions based on archive material in its own space (Ausencia_Archivo) and in other spaces in the city of Barcelona (On Mediation). How can we identify the concept of absence in the archive? Every archive is incomplete: in which sense and why? Dossiers that were consulted included a number of different exhibitions, selected for varying reasons. The exhibition The End(s) of the Museum, for instance, was chosen not only because it problematized the disappearance of the museum as an institution, but also for its lack of existing archival material. Indeed, it is one of the few Fundació exhibitions for which the documentation has been lost. A group of students interested in the difficulties of international communication – as a result of language or different cultural backgrounds – studied correspondences between Spain and Japan, including emails, letters, and faxes, that preceded an exhibition of Antoní Tàpies in Japan. 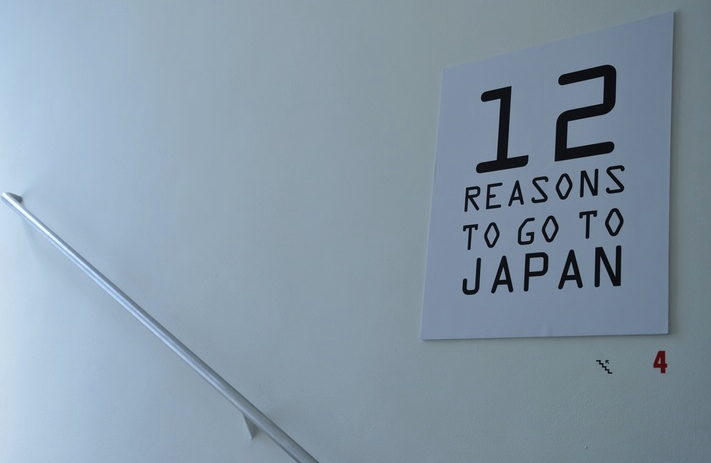 This became the starting point for their work, titled 12 Reasons to go to Japan. 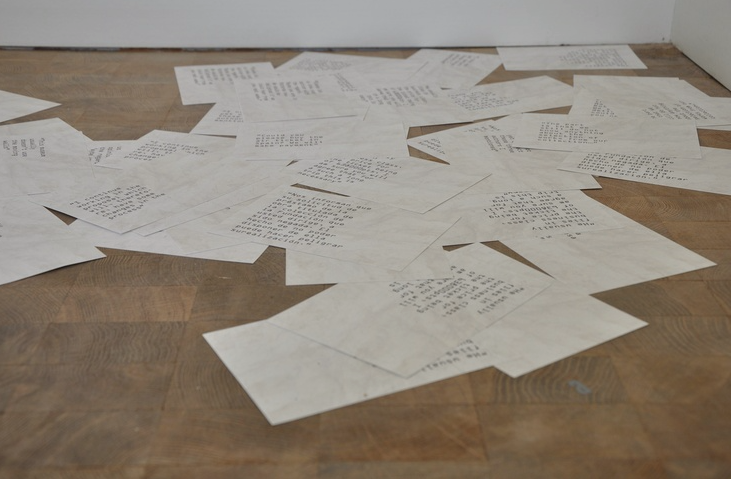 They filtered out sentences that reflected communication difficulties, such as apologies for misunderstandings, and wrote them on postcards then placed in the exhibition space. Those cards, located at the sides and on the steps of the stairways, could be taken home by the audience. 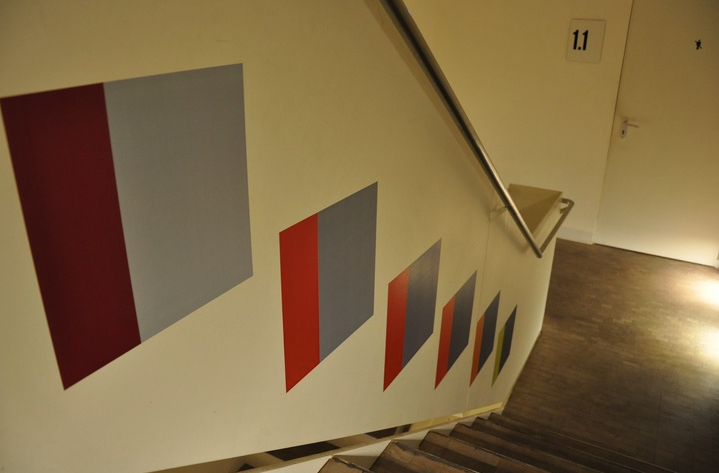 The seven installations and interventions that were created on the basis of the archival material were exhibited in the margins of the institution; areas of passage and transit were used, where the artwork is normally not present, such as stairs and corridors. This idea had already been used within the exhibition The End(s) of the Museum by Bill Fontana to present his sound installation Time Fountain (1995). One important goal of the project was to confront the archive with the work of the students and to ensure at the same time that knowledge does not only stay in the frame of the university, but comes into contact with the professional world. A short video and some texts on the Open Source Protoypes blog explain expectations and ideas from the participants’ point of view. 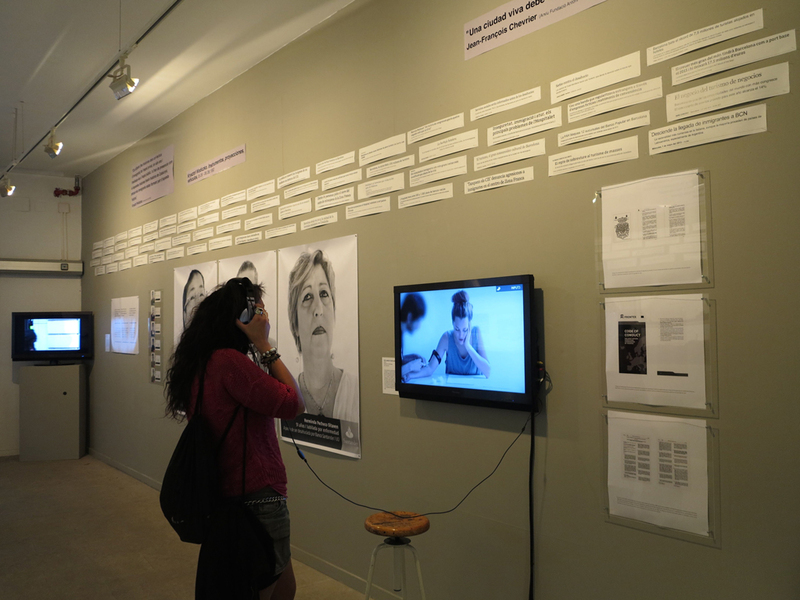 Along with the description of Ausencia_Archivo on the website we can find an image gallery of the exhibition’s results. This documentation (text, image, video), while slim, adds another layer to the programme. Although it might not be easy to reconstruct the intervention itself without having participated, the documents still give an insight into what the work was like. At the same time, these online materials contribute to the proliferation of discourses around the “archive itself” and around “working with the archive”. In May 2014 the Fundació Antoni Tàpies engaged in another cooperative project as part of Open Source Protoypes. With the University of Barcelona (Department of Art History) the exhibition On Mediation 2: Barcelona Inspira – part of the three-part exhibition-cycle On Mediation – was developed and shown in the gallery space of Sant Lluc. Sant Lluc is a centre for artistic practice in Barcelona with a small Modernist collection, an exhibition space for changing exhibitions, and the possibility to take different public art classes. Project documentation is not yet on the Fundació’s website, but newspaper articles and online summaries describe the intervention. These sources show how work with archive material may expand to other spaces, outside the museum and the Fundació Antoni Tàpies. 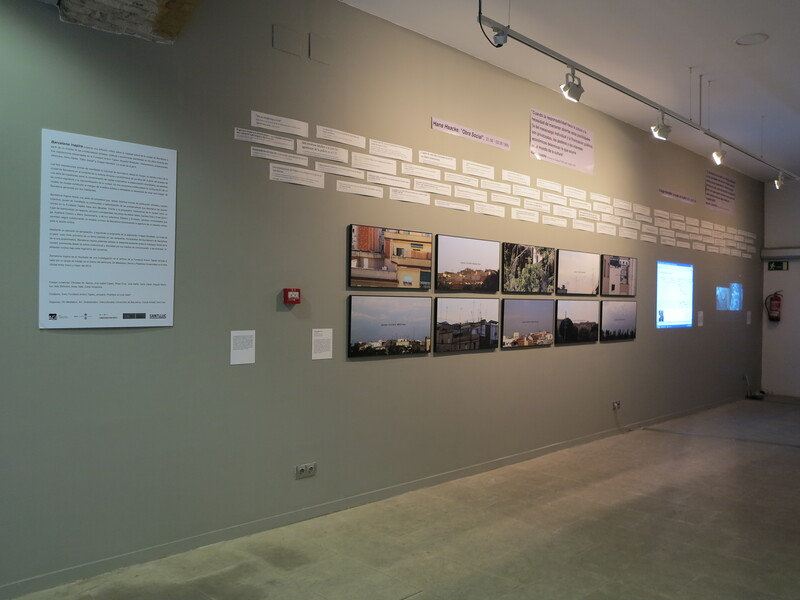 The exhibition dealt with current urban problems in Barcelona, starting from the idea that those problems are not very different from the situation of the city in the 1990s: Housing difficulties, real estate speculation and the privatization of common goods, all problems that have existed from before. To draw this connection, On Mediation 2: Barcelona Inspira combined material the students of DEIÀ created, drawing on the Fundació archive, and new works by contemporary artists. For the work with the archive the students used correspondences and press articles concerning three different exhibitions shown in the Fundació in the 1990s: Krzysztof Wodiczko. Instruments, Projections, Vehicles (1992); Hans Haacke. 'Obra Social ' (1995); Craigie Horsfield. The City of The People (1996). They then filtered out citations by Wodiczko, Haacke and Horsfield, who had each commented on the city’s situation during their respective shows. 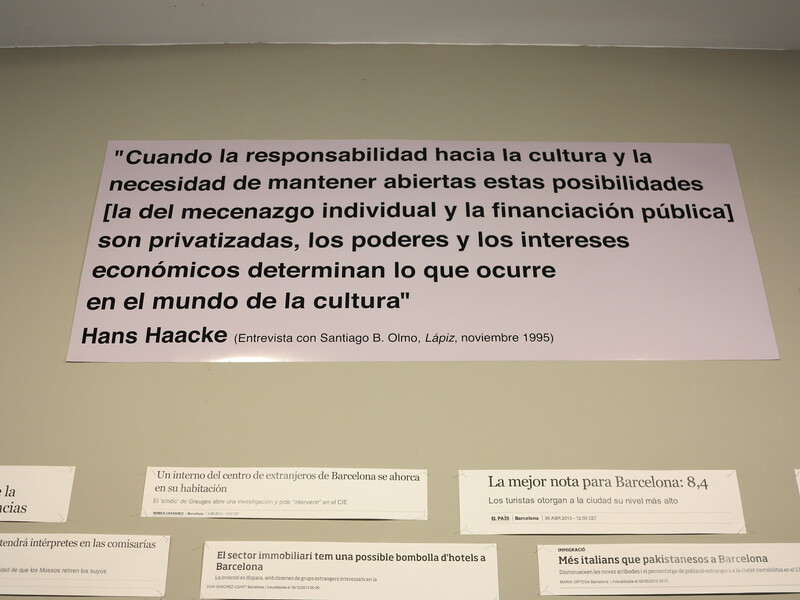 One group of students, for example, examined the exchanges between Hans Haacke and Fundació director Manuel J. Borja-Villel, as well as the research documents Haacke had put together on real estate speculation and the city of Barcelona. Excerpts from these documents thus became part of the exhibition. Furthermore the students worked with press articles on the exhibitions of Wodiczko, Haacke and Horsfield in order to highlight the media attention they had at the time. Citations of those articles were part of the exhibition as well. Next to those archive materials, On Mediation 2: Barcelona Inspira displayed works of contemporary artists who deal with the city’s current difficulties, and who criticize current political tendencies. These works problematized the concentration of capital, the decay of the public sphere and migration politics. In total, the exhibition consisted of five projects done by seven artists, two of them “duo collectives”. The collective Enmedio presented documentation of an action from 2012. The work showed portraits of people who could not pay their debts to the bank and were evicted from their houses. Each portrait was accompanied by a short explanation of their present living circumstances. Besides these pictures were postcards addressed to the bank with a longer biography of each person and the proclamation “We are not numbers”. Another work, a photo series (2013) by Adrian Melis, consisted of sixteen images that depicted houses expropriated by banks. Each photograph bore the date of eviction and the name of the bank, the house’s new owner. On Mediation 2: Barcelona Inspira shows how archival material can be made productive for an exhibition, while combining such reformulations with new artistic works. 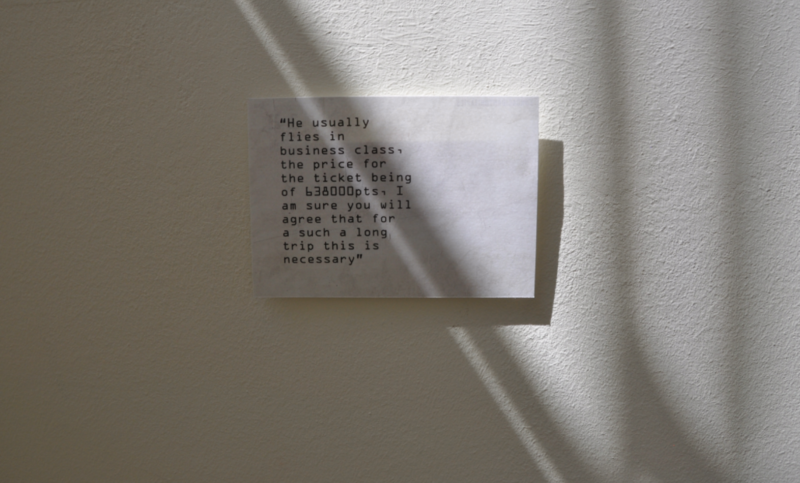 Citations and press quotes were used to re-actualize the critique on urban policy formulated by Wodiczko, Haacke and Horsfield in the 1990s and this message reinforced the new works exhibited in parallel. Furthermore the exhibition proves in which ways the archive can be engaging for a wider circle of recipients. The fact that the show took place in another venue in Barcelona underlines this idea. With its participatory programmes and with its archive, the Fundació Antoni Tàpies places the emphasis equally on the artwork – no longer considered as the sole producer of knowledge – and its documentation. Thus the archive becomes another “epistemological centre” of the institution. The documentation of an exhibition, including the administrative files that are needed for its set-up, also gives insight into the institution itself, its proceedings and curatorial concepts. An archive with an open, transparent access for visitors, and participatory programmes to engage them, might serve as a tool to multiply discourses and create different forms of knowledge around archiving and the archive itself. The way the Fundació guarantees open access has a circular structure. Documents that are used by the visitors create new archive material – as we saw – in forms of exhibitions or interventions. This then becomes part of the institution and may be used as an archival source. 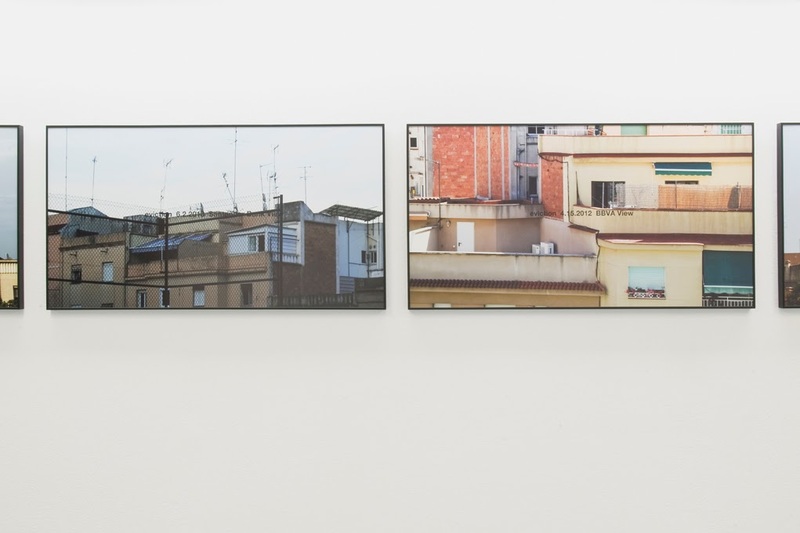 The exhibition as a “temporal event” [MACBA Study Center 2014: 9] has a limited radius of reach. Documentation and open access can ensure that a wider public can discuss it, beyond its original presentation. In the programmes initiated by the Fundació, the “online space” of the archive does not replace its actual “physical space”. Working with “real” material – paper, documents and photos – evokes a different materiality and is another way to make the reality of the archive visible. The fact that the Fundació actively includes the physical space of the museum into the work on archive material is an innovative way to encourage its visitors to appropriate these documentations. It might also be seen as link to the present development of an increasing number of exhibitions dealing with archiving, as described in the beginning of this text. Thanks to Núria Solé Bardalet, who gave me copious information during my stay at the Fundació and via email correspondences. Thanks as well to Antonio Llácer for further advice and the translation of the Catalan/Spanish texts, to Christian M. Alonso for information around the exhibition On Mediation 2: Barcelona Inspira and to Eric P. Morrill for the English corrections. Jasmin İhraç (Berlin) After having received her degree in Sociology (Diplom, Freie Universität Berlin), she studied Contemporary Dance, Context and Choreography at Hochschulübergreifendes Zentrum Tanz Berlin (HZT). Currently she works as a freelance choreographer and dancer. From 2012-2014 she worked as a research assistant in the DFG-funded project Media and constitutive systems: Archiving performance-based art (HMT Leipzig/HZT Berlin). In her research she focuses on performative practices and processes of archiving in political contexts. Her soli and group pieces were presented at Roter Salon/Volksbühne Berlin (Trois Voies), Ballhaus Naunynstraße (Mj'a sin-Verflechtungen) and Tanzfabrik Berlin (iz-le) a.o. The solo On Speeches was part of the exhibition Flamme Éternelle by Thomas Hirschhorn at Palais de Tokyo/Paris in May 2014. Currently she dances a.o. in Collective Jumps by Isabelle Schad. The archive of the Haus der Kunst opened in 2005. Since 2014 the historical collections are integrated permanently in the museum space. See: http://www.hausderkunst.de/en/research/history/historical-archive/ (20/4/15) MACBA’s archive is open for public consultation since 2007 and is complemented by an artists’ archive: http://www.macba.cat/en/archive-library (20/4/15) Additionally, in 2007 the MACBA Study Center (CED) was founded “with the idea of promoting and enriching the role of the Museum as an agent of research, linking its exhibitions with the study and production of knowledge in the field of contemporary art. CED compiles, organises, conserves and diffuses MACBA’s documentation.“ [MACBA Study Center 2014: 10]. The investigation of these kind of archives is another field of research of the above mentioned project “Records and Representations”. (footnote 1). The scheme is only accessible in the physical archive of the Fundació Antoni Tàpies. The exhibitions Tour-isms. The Defeat of Dissent (2004), The Dream of the Audience: Theresa Hak Kyung Cha (2005), Tàpies’ posters and the Public Sphere (2006-2007), Tàpies Japón and The End(s) of the Museum (1995) were included, among others. Els Límits del Museu (The End(s) of the Museum). Catalogue Fundació Antoni Tàpies, Barcelona 1995: 98. The curatorial team that prepared On Mediation 2: Barcelona Inspira consisted of Christian Alonso, Ana Isabel Cajiao, Rosa Cruz, Julia Keller, Irene Llàcer, Raquel Machtus, Ada Sbriccoli, Arola Vall, Celia Yonamine and was coordinated by Christian Alonso in the frame of the seminar On Mediation/1, an activity organized by the research group AGI (Art Globalization Interculturality) of the University of Barcelona. For more information see: http://onmediationplatform.com/es/barcelona-inspira (19/7/15). For more information see http://www.santlluc.cat/index.php?lang=cat&sec=Portada (20/4/15). Sant Lluc was founded in 1893 by leading figures of Modernism, such as Antoni Gaudí, Alexandre de Riquer, Josep Llimona a.o. and has promoted this spirit and direction of artistic work until today. In a statement on the institution we can find the following description: “The Cercle Artístic de Sant Lluc is an association funded (sic) by a group of artists in the acme of the Modernisme. It was born with polemic intentions toward bohemian artists, which were more individualist and ideologically groundbreaking. [...] After the modernist period, Sant Lluc maintained its central role in the artistic environment, gathering prominent artists and fostering young creators as Miró or Perejaume. Our association has always been engaged with the arts in a broad sense [...] With its life and still sessions, its painting, molding and engraving and photography rooms, its excellent models and the more than 40 hours a week of pose, Sant Lluc is a unique space for art and drawing.” Cercle Artístic de Sant Lluc, Visitor information. Email correspondence with Christian M. Alonso, curator of the exhibition. Els Límits del Museu (The End(s) of the Museum). Catalogue Fundació Antoni Tàpies, Barcelona 1995, p. 9. Quotation by Núria Solé Bardalet in an interview in Barcelona in May 2014. Büscher, Barbara. Archiv Werden: Das Projekt 're.act.feminism' als Demonstration eines Zugangs zu Performance-Geschichte, 2014, http://www.perfomap.de/map5/instabile-ordnung-en/archiv-werden (28/3/15). Cramer, Franz Anton. D’un moment l’autre: à propos de l’événement-performance et sa matérialité contemporaine. Lecture given at Université Rennes 2 on 6 February, 2014 as part of the international conference De l’archive au reenactment—Les enjeux des (ex)positions de la performance, 5 to 7 February, 2014 (unpublished). Els Límits del Museu (The End(s) of the Museum). Catalogue Fundació Antoni Tàpies, Barcelona 1995. MACBA Study Center. Folding The Exhibition, Barcelona 2014, http://www.macba.cat/en/essay-folding-the-exhibition (20/4/15). Rassel, Laurence. 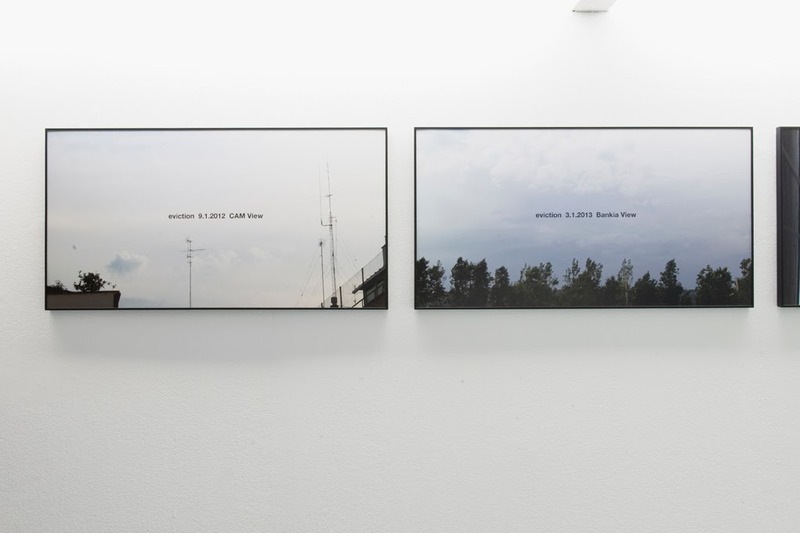 Polyphonic recounting – Opening the institution; the case of the Fundació Antoni Tàpies Barcelona, 2014, http://www.perfomap.de/map5/transparenz/polyphonic-recounting (21/1/15). Video about Open Source Prototypes, http://www.fundaciotapies.org/blogs/zoom/prototips/ (21/1/15). We Open 03/2010. Brochure Fundacío Antoni Tàpies, http://www.fundaciotapies.org/site/IMG/pdf/Brochure.pdf (20/1/15). Blog of the Design School EINA, http://blog.eina.cat/es/projecte-de-collaboracio-entre-la-sala-d-art-jove-la-fundacio-tapies-i-eina/524ad1c84fd94888130000b3 (14/1/15). Exhibition Tour-isms. The Defeat of Dissent, http://www.fundaciotapies.org/site/spip.php?rubrique108 (14/1/15). Exhibition The Dream of the Audience: Theresa Hak Kyung Cha, http://www.fundaciotapies.org/site/spip.php?rubrique521 (14/1/15). Exhibition Tàpies’ posters and the Public Sphere, http://www.fundaciotapies.org/site/spip.php?page=view.ft_publication&lang=en&id=131 (14/1/15). Exhibition The End(s) of the Museum, http://www.fundaciotapies.org/site/spip.php?rubrique462 (14/1/15). Marc Grèbol: Què inspires, Barcelona? Barcelona. 16.06.2014, http://www.nuvol.com/noticies/que-inspires-barcelona/ (14/1/15). Programme Sant Lluc, http://www.santlluc.cat/index.php?lang=cat&sec=exposicions&men=programacion&opc=actual&id=390 (14/1/15). Blog of the Fundació Antoni Tàpies to On Mediation 2: Barcelona Inspira, http://www.fundaciotapies.org/blogs/zoom/larxiu-de-la-fundacio-col%C2%B7labora-a-la-primera-edicio-del-projecte-on-mediation/ (14/1/15). On Mediation. Cicle d’exposicions 1a edició del 12 al 31 de maig 2014, http://artglobalizationinterculturality.com/wp-content/uploads/2014/05/agi-on-mediation-series-of-exhibitions.pdf (14/1/15). Press Release to On Mediation 2: Barcelona Inspira, https://soundcloud.com/on-mediation/barcelona-inspira-nota-prensa (24/2/15). Exhibition Hans Haacke. 'Obra Social ', http://www.fundaciotapies.org/site/spip.php?rubrique463 (14/1/15). Exhibition Craigie Horsfield. The City of The People. http://www.fundaciotapies.org/site/spip.php?rubrique467 (14/1/15). Exhibition Krzysztof Wodiczko. Instruments, Projections, Vehicles, http://www.fundaciotapies.org/site/spip.php?rubrique136 (14/1/15).